If there is two things I love in life it’s Lush and seasonal products, so when the two combine it can only mean good things. 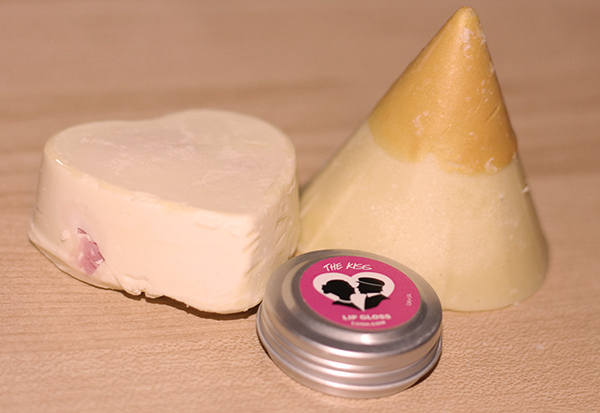 I was delighted when Lush sent over some products from their Valentines collection for us to try out. This is a brand new product from the Lush Labs, its a lovely Vegan friendly gloss that contains zero nasties! This will makes sure your lips are extra kissable for Valentines, I love the subtle pink sheen this has and it smells amazing, but you could have probably already guessed that considering everything from Lush smells amazing! When you think of Valentines and pampering this is exactly the scent you’d expect, packed with vanilla, jasmine and ylang ylang this smells gorgeous! So relaxing and warming its perfect for a romantic night in or just a little Sunday pampering day. The butter melts away so easily to reveal a lovely fondant centre, this is by far my favourite! This isn’t the usual scent you’d associate with a Valentines or massage products, its really fresh and energising and really awakens your sense, so this is perfect for using in the morning or if your feeling a bit rubbish as the citrus scents will really boost your mood! I loved these Valentines products from Lush, and I think they'd make a great last minute gift for your Valentine, but an even better gift for yourself!